Vitamix 5300 vs. 7500 – What’s the Difference? These tried and true blenders are some of the best Vitamix’s you can get for the price. That’s why they’re both included in my top 5 Vitamix blenders guide. But when you compare the Vitamix 5300 vs 7500 you’ll quickly notice that these two models are very similar – almost identical. The Vitamix 7500 is just an upgraded next generation model of the Vitamix 5300. So are these upgrades actually worth the difference in price? Let’s take a deeper look at the differences between the 5300 and 7500 so you can decide which model is right for you. The motor is where you’ll find the biggest differences between the Vitamix 5300 and 7500. The Vitamix 5300 uses the classic motor and housing while the 7500 has been upgraded with a next generation motor and suspended motor housing. This next generation motor is the same motor used in the Vitamix 750 and other newer Vitamix blenders. The Vitamix 7500 motor is slightly stronger at 2.2 HP compared to the 2.1 HP of the 5300 but this difference is very subtle – virtually unnoticeable when blending. The main improvement that the next generation motor gives the 7500 over the 5300 is in noise levels. Because of the suspended motor housing the Vitamix 7500 is advertised as 40% quieter than the 5300. Another bonus of the suspended motor housing is that it allows for bigger air intake vents. This means the Vitamix 7500 can keep its motor cooler and is less likely to trip the thermal sensor, shutting off your blender. While this isn’t usually an issue with the Vitamix 5300, the thermal sensor can occasionally be tripped after long periods of blending or while making hot soups. So what does all of this mean when it comes to blending? Overall, you’re not going to notice a difference in blending quality or capability. Anything you can make on the Vitamix 7500 you’ll be able to make with the Vitamix 5300. They will both make you the silky smooth and creamy smoothies that Vitamix has become famous for. The Vitamix 7500 will just do it slightly more efficiently and a lot quieter than the 5300. The Vitamix 7500 is the clear winner here. Its next generation motor is slightly stronger, 40% quieter, and runs cooler. Here’s 4 superfood smoothies you can try out on your new Vitamix! The Vitamix 7500 is advertised as having a more sleek and modern look compared to the Vitamix 5300 but this really comes down to personal preference. The Vitamix 7500 is available in black (as pictured above), red, or white. The Vitamix 5300 is available in black (as pictured above) or red. It’s a tie! This one really comes down to personal preference. The Vitamix 7500 is more sleek and modern and offers an extra color option over the Vitamix 5300 but the settings and controls are identical. What Extras Does it Come With? Another important distinction between the Vitamix 7500 vs 5300 is the extras that you get when purchasing. Each blender comes with the basic low profile 64-oz pitcher, tamper, and getting started cookbook. The low profile 64-oz pitcher is great because it allows you to store the Vitamix blenders on your kitchen countertops without hitting any cabinets. The taller and skinnier 64-oz pitcher that comes with other models like the Vitamix 5200 is too tall to be stored under standard 20″ kitchen cabinets. If you are wanting a different pitcher for your Vitamix 5300 or 7500 you will have to buy it separately (for around $75-$150). The Vitamix 7500 is the winner here thanks to the Simply Fresh cookbook with over 200 recipes. 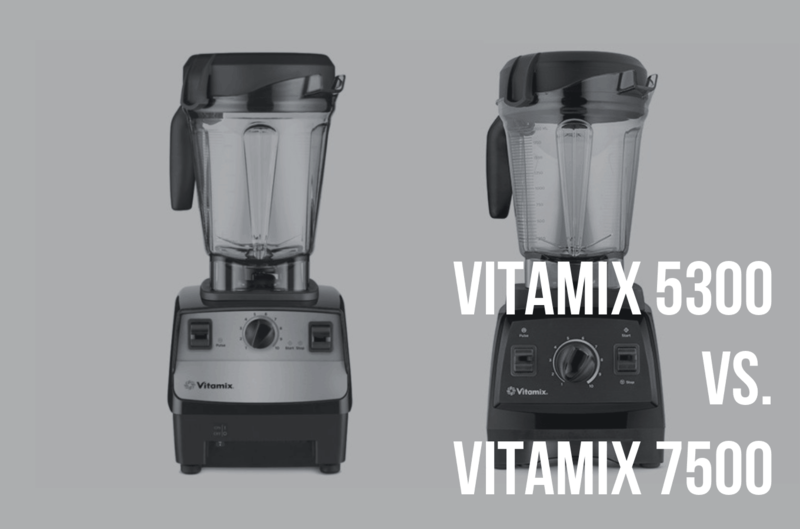 The price comparison between the Vitamix 7500 vs 5300 is where things get interesting. You can either buy your Vitamix blenders brand new (not recommended) or certified refurbished (saves close to $150). If you’re buying it brand new then the Vitamix 5300 and 7500 are the exact same price. This makes the 7500 a no-brainer. As far as quality goes, a Vitamix refurbished blender can be considered as good as new (only much cheaper)! Each refurbished blender has to pass the exact same inspection process that a brand new Vitamix blender goes through. Refurbished blenders consist of lightly used returns or display models. All lids, pitchers, and tampers, as well as any worn or visually marked parts are all replaced with brand new parts. Each blender is then repackaged in the same packaging that a brand new blender comes in along with the recipe books and extras. Refurbished blenders also come with a 5-year warranty, so if it’s defective in any way you can send it in for a replacement free of charge. The only difference between new and refurbished is the price tag! If you’re buying refurbished then the Vitamix 5300 is slightly cheaper at $359 compared to $399 for the 7500. The Vitamix 7500 is technically an upgraded model of the 5300 so whether or not those upgrades are worth the extra $40 really comes down to personal preference on the looks and how much of a concern noise levels are. Vitamix blenders are powerful and loud regardless of the model, but if noise is a concern for you then you’ll want the 40% quieter Vitamix 7500. Otherwise you can go with the Vitamix 5300 and save yourself $40. Overall, the Vitamix 7500 is the better blender. If you’re buying brand new then both models are the same price. If you’re buying refurbished, the upgraded 7500 is still only $40 more.